Quite often on my trip I show my ignorance and/or naivety when it comes to wine. This isn’t hard to believe considering how big the wine world is, how many wineries and how many regions there are. It was one of the first things that excited me about working with wine, is that it is essentially impossible to know everything about wine, but I liked the challenge regardless. Sometimes these instances are a little more embarrassing, such as not knowing what the whole left bank-right bank thing referred to. My former employer King & Godfree prides itself on the range of fortified wines it stocks, particularly their sherries, so I was familiar with the different styles and many of the better known houses. So when I got in contact with one of my favourite producers noting my dates in Jerez, I was very embarrassed to discover that they aren’t even in the same province. The surprises didn’t stop there, as I had one of my most enlightening visits in Spain. Toro Albala is a very special winery indeed. It is considered one of the top wineries in the country and for good reason. 50 km south of Córdoba the winery calls the village of Aguilar de la Frontera home. It was founded in 1944 by Antonio Sánchez Prieto, who initially made the wine using homemade equipment. The naming of some of the wines as Electrico actually refers to the fact that winery is actually a restored electrical plant, with the tunnels underground being used to age wines. This is why it is not uncommon to hear such phrases in Cordoba as “electrify me” and “what is the voltage of the wine?” Much of the fruit for the wine comes from estate vineyards, but they also purchase some to boost the still increasing demand for their wines around the world. This was one of the first opportunities for me to be surprised. Before phylloxera swept through this part of Spain over 100 years ago, there was a lot of pedro ximinez planted in Jerez close to the Mediterranean. When they re-planted, they decided to only plant palomino, and preferred to use the pedro ximinez from the Montilla-Moriles area as it was warmer and drier, much better for ripe fruit that can dry easily. This means that what is considered as sherry wine is not technically grown in the sherry area. The winery is an amazing historical reference point, as they have one of the largest collections of wine publications in the world. I was introduced to this amazing resource by my host Antonio, who gladly accepted my proposal to include any books I may write in the future into the collection. 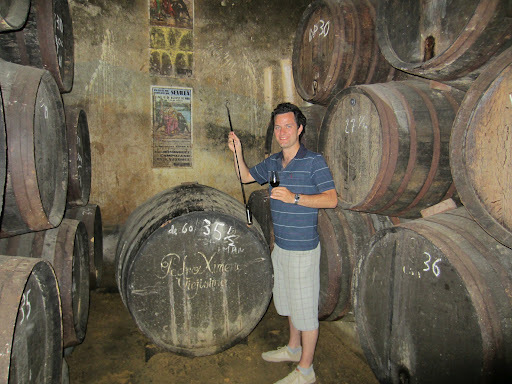 Antonio took me into the cellars, where the wines age in the classic solera system. For those uninitiated in the intricacies of sherry wine, there are usually four levels of barrels placed on top of each other. A minimum of three times per year, wines are bottled and barrels are filled from the top down. 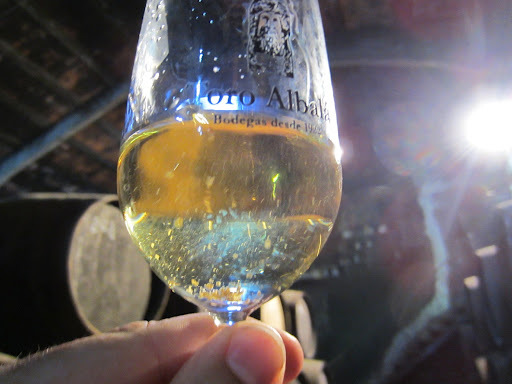 The barrels are not completely filled to allow an oxidative process to impact on the wine, in the case of fino wines a layer of furry flor forms that protects it. 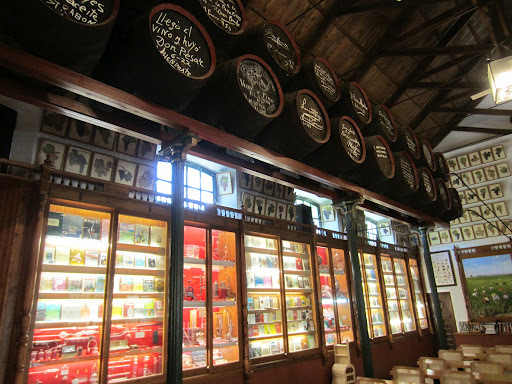 Toro Albala makes every style of sherry wine, but in the cellar you can find such treasures as vintage amontillado and pedro ximenez dating back over 100 years. One of my dreams on this trip has been to taste sherry wine from the solera, particularly the dry styles that just aren’t the same by the time they reach Australia. I was really glad to have this chance at Toro Albala, as these wines are truly exceptional. It was also a nice surprise to go away with a few bottles that I intend to open for my birthday this weekend. Click here to read my notes on the tasting from the barrel. Click here to see more photos from Montilla-Moriles, Spain. Following this I spend the weekend in Malaga, and managed to fit in a visit to Telmo Rodriguez’s vineyards in the hills.